We’re stoked you're visiting Mx-World! 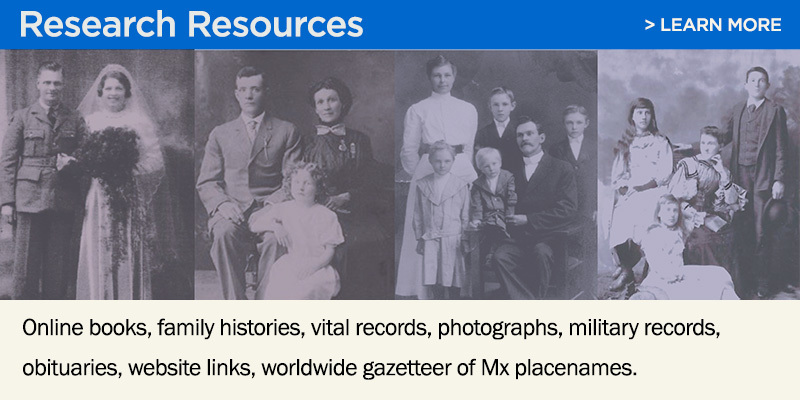 The International Molyneux Family Association is a forum for the exchange of genealogy and family history for people interested in the Molyneux surname (and its many variants). Our publications and online forums include our 28-page quarterly newsletter, this website, our DNA project, and our Facebook pages. IMFA relies on members to provide content for these media. We welcome your participation! 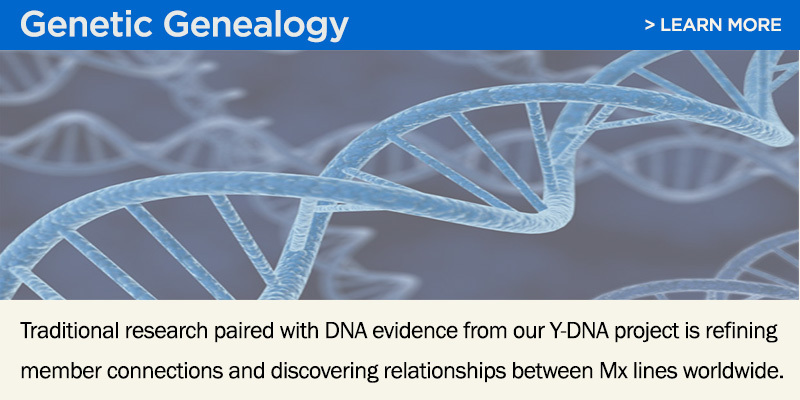 Learn more about DNA and genetic genealogy in our new DNA Bibliography, recommended reading to further your understanding of DNA. In addition to printed resources there are several YouTube videos by the authors, such as the one below. Otto B. Mullinax (1912-2000) was a founding member of the International Molyneux Family Association (IMFA), formalized by its first newsletter in August of 1986 by founder and then editor Wesley L. Mullenneix (1919-1975). Since the spring of 1998, it had been Otto’s wish that an updated edition of this book, be co-authored by IMFA. Not resting on the research that led to its publication in 1982, Otto continued to research, making hand-written notes of additions and changes in the margins of his “master” copy. It was this master copy he gifted to IMFA. From this "master" copy IMFA created a fully searchable 2nd Edition PDF version, incorporating Otto's changes plus additional commentary by IMFA researchers. IMFA members / volunteers who have contributed to this project: Jim Molineux, Marie Mullenneix Spearman, Steve Mullinax and Wayne Straight. The GRO has a PDF pilot program for at least the next three months. If you have Great Britain ancestry, this could be really beneficial; also, quicker than snail mail. The extended Pilot covers PDF copies of those historical digitised civil registration records held by GRO (i.e. birth entries from 1837 - 1916 and death entries from 1837 - 1957). A GRO index reference is required to be provided with the application. You can find the GRO index references by logging on to the GRO online ordering service and accessing the GRO online indexes. A PDF will cost £6.00 each. 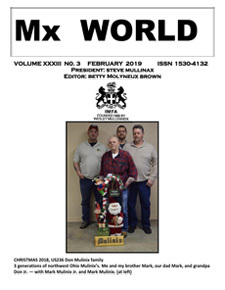 The February 2019 edition of MxWorld is available now on our website. 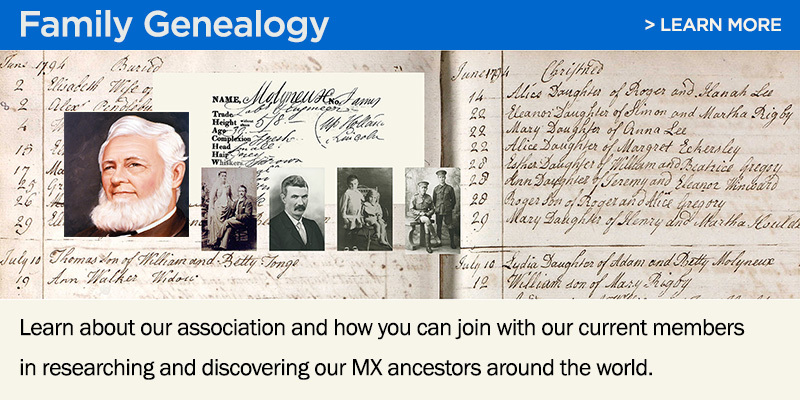 Member MxPedigrees began appearing on the website several years ago as part of the DNA Surname Project. We are in the process of expanding the pedigrees to include information submitted by past and present members for publication in MxWorld. 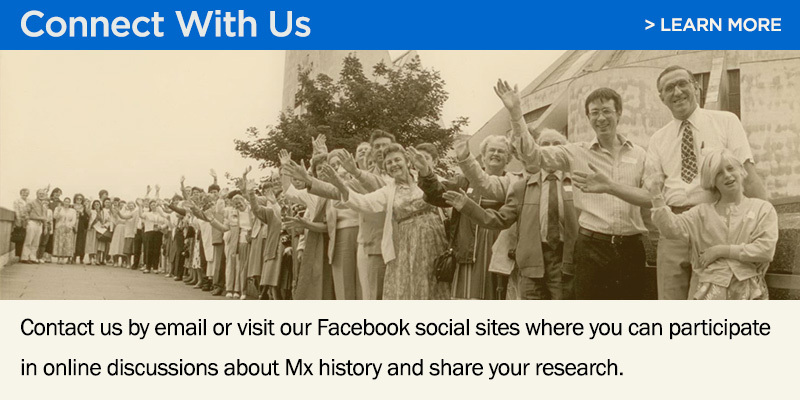 When the project is completed you will be able to upload a GEDCOM file of your Mx ancestry where it will become part of a searchable all-name database of member GEDCOMs. Until then, you can add or update your information on this website at Add/Edit Pedigree Information. This information can be accessed by our members using the new Pedigree Search. Names of living individuals, or individuals with a birth date after 1911 and no death date, are automatically hidden on the website. Who Will Inherit Your Genealogy Research? This Genealogy Will is being posted so you can designate who you would like to see inherit your genealogical research. Example: You can leave your research to a family member, a society or perhaps a study partner. Print out this will and place it with your family papers. 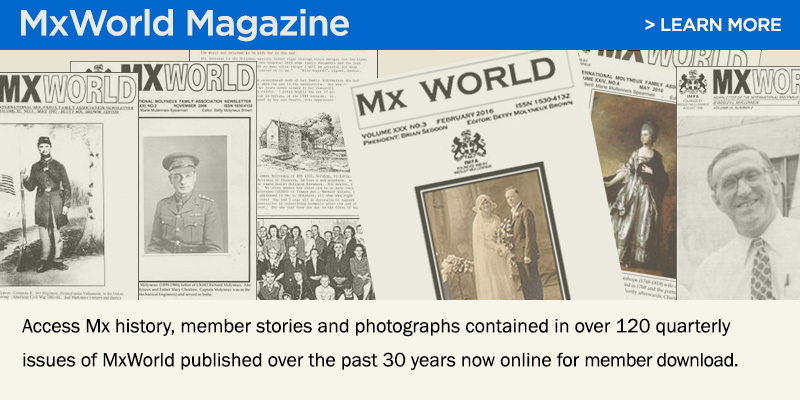 As part of our Resources section of the MxWorld website we wish to further develop the Military records. Brian Seddon AU019 contributed the information to kick-start this project. We have a large number of records relating to Mx service personnel in WWI and WWII. We have commenced putting some of these records on our website but some of the remaining material requires minor editing or further research. 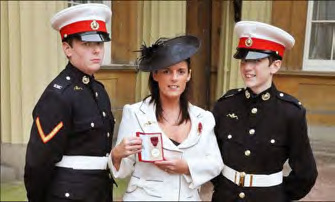 This is not an onerous or long-term commitment but may appeal to a member with a particular interest in military history – we would be delighted to have someone take on this role. 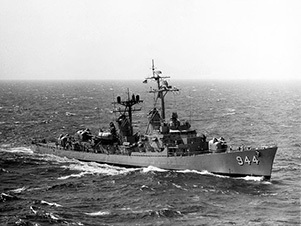 USS Mullinnix (DD-944) was a Forrest Sherman-class destroyer of the United States Navy. She was named for Admiral Henry Maston Mullinnix USN (4 Jul 1892 - 24 Nov 1943), who was killed in action during World War II, when the aircraft carrier USS Liscome Bay was torpedoed by the Japanese submarine I-175 and sank southwest of Butaritari Island on 24 November 1943. I could really use your help? What can you tell me about these “earliest Mullinaxes I have found immigrating to the New World”? Who was Richard Mullinax, one of 31 “gentlemen” who arrived in Virginia, January 2, 1608, on the ship John Francis? Another Richard Mullinax signed a contract of indenture in 1684 to come to “Mariland” on the ship Golden Lyon, under Capt. Longman. These, and others, are mentioned by Otto Mullinax in his 1982 book (p.3), Some Mullinax Roots: South Carolina to Texas. What was their fate? Are you descended from one of them, or do you know if they had descendants? Otto’s book was a pioneering genealogy; Otto applied research and analytical skills honed through decades of legal practice. It’s been 37 years since that publication, which predates the founding of IMFA. All Otto’s research was done before genealogical information was widely available on the Internet, and before the ubiquitous use of social media. Genealogists of his generation still used postage stamps for their correspondence! (I won’t take space to explain what those are.) For you youngsters, Google has a wealth of information. Ancestry.com went on line in 1996, and today provides about ten billion historical records for three million paying subscribers. Today, IMFA has our own excellent web site and a number of active Facebook pages. Genealogists have access to records, databases for organizing family history, and ways of “talking” to each other, that Otto’s generation could barely dream of! We could have (and I invite!) a useful discussion of how we can extend, update and correct the research by Otto and others. 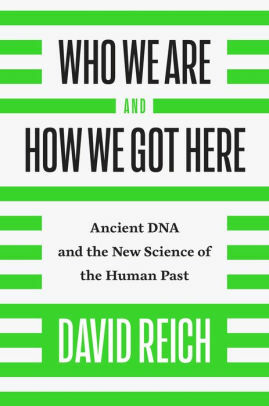 Like any science, genealogy progresses by our critical engagement with the thinking of earlier generations. As you know only too well, no genealogy is ever complete, or completely correct. What can we, as a community of curious interested people, add to or fix in earlier work? What have we learned, in the decades since 1982, considering the engagement of new generations of genealogists and our access to a wealth of new sources? So, please help me out! What can you tell us about these or other Mx’s mentioned in Otto’s book, especially the earliest immigrants? What does your experience tell us about how to apply today’s tools to expand, update and share the research of our forebears. Send me an e-mail or letter, or chime into a conversation on one of the IMFA Facebook pages. From time to time we all find ourselves facing an apparent brick wall in our research efforts. We find pieces of the puzzle are missing and cannot be found. Sometimes another pair of eyes or knowledge of a little known document resource can break the barrier and open new connections. If you find yourself in that situation we might be able to help. Request help.